Tom Thumb was the first American built steam locomotive to be operated on a common-carrier railroad. The creator of the locomotive, Peter Cooper, built Tom out of the materials he had available in 1830. Peter Cooper modeled Tom Thumb after British locomotives. He wished to prove that steam locomotives were or would be superior to horse drawn rail cars, and he was intent on replacing horses with steam locomotives. This locomotive was to be used on the Baltimore and Ohio Railroad. To prove whether or not steam locomotives were superior to horses, during the summer following Cooper’s creation, the owner of the Baltimore and Ohio Railroad held a race between Tom Thumb and a horse pulling equal loads. Tom was in the lead, until an engine belt slipped off allowing the horse to pull ahead. 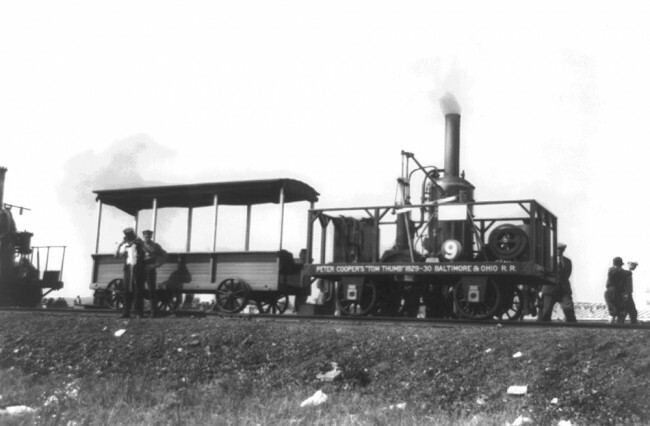 Peter cooper still had faith in the pioneer locomotive. On August 28th, 1830, Tom Thumb made the 26 mile round trip to Ellicott’s Mills pulling a carload of businessmen and journalists in a little over two hours.